Many of the activities in our day don’t actually help us close more deals. We’re busy doing things, but they aren’t moving our deals forward. 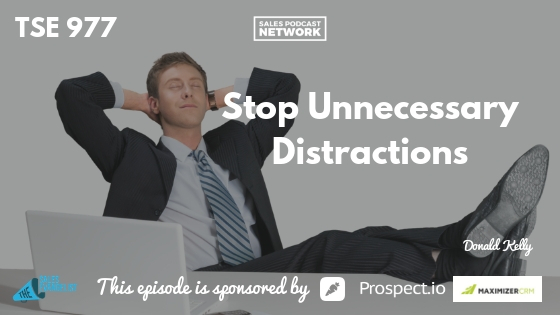 Today we’ll talk about the things that distract us as sales reps, and how we can stop unnecessary distractions that are actually hindering our efforts. Email is a necessary part of our sales efforts but spending time cleaning up our email isn’t an effective use of our time. If this were a football game, you wouldn’t be in the locker room trying to learn plays. Once the game starts, you’ll spend your time trying to advance the ball and score. Very often, we are hesitant to do the things that we really need to do. We don’t want to make cold calls or try to upsell our existing customers. If you go to the kitchen to get a drink, write it down. If you talk with other team members, write that down and record how long it takes. Record all of your activities: email, updating CRM, creating proposals and attending meetings. Write down how long you spend on planning and social media. If you get sidetracked by your cell phone, write it down, and write the time next to it. As you do this over the course of a week, you’ll begin to see trends in your daily activity. Be honest about your activity and look for places that you can use your time better. 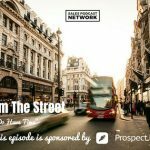 Could you take a shorter lunch break a couple of days a week to create more time for sales activity? Score every activity on a scale of 1 to 3: 1’s are things that don’t help you close deals, while 3’s are things that contribute greatly to your closings. You can even use a 1 to 5 scale if that works better for you. Find the activities that aren’t helping you close deals and pay attention to the amount of time you spend on those activities. Once you’ve identified the things that aren’t helping your efforts, figure out how that time spent cleaning out your email can be better used. Over time, these small amounts of time add up to hours that we could be using to focus on something productive. [9:13] Instead of checking ESPN, I could reach out to a prospect on LinkedIn. Eliminate tasks that you don’t need to do. Ask for accountability from your manager or your coworkers. Use apps that prevent you from accessing distracting websites. Intentionally focus on those activities that scored higher on your list. Outsource those activities that bog you down. Audit your time to see how you’re spending it. Rate your activities and eliminate unnecessary tasks. Hyperfocus on the important activities. This will change your business and your personal life when you implement it.